Gabriel Clark is a visual communication design practitioner and academic whose expertise is in motion design, digital photo media, comics and multiplatform storytelling. His focus is on design and narrative and using practice-led research to understand and identify design led methodologies within the processes of producing storytelling projects. This research extends into producing public facing events and programming in arts festivals and producing online storytelling projects. 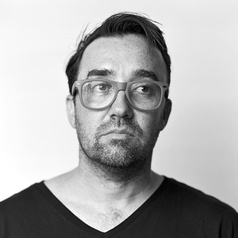 He is one of the co-founders of the Graphic festival at the Sydney Opera House. He conceived and produces the award-winning multiplatform storytelling project Radio With Pictures and is a co-founder and producer of the live comics / graphic storytelling event Read to Me. His photo media projects explore the aesthetics of digital materiality in photography. This work has been exhibited throughout New South Wales and is held in private collections in Australia and England. He lectures and teaches in the fields of narrative and visual communications design covering sequential art, digital photo media, motion design and moving image design.